Another day, another exciting Grad Ball announcement! We are pleased to announce that Club Drive will be supporting alt. 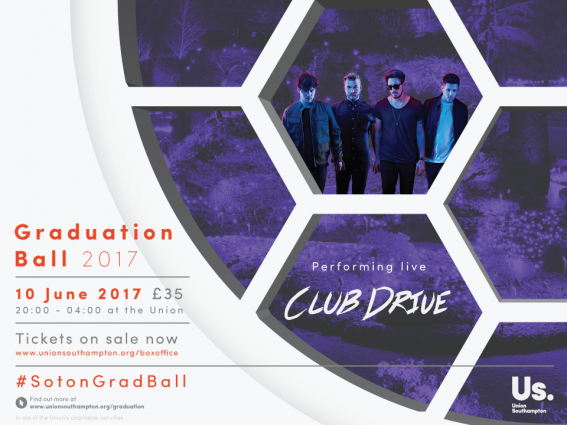 rock band, Don Broco, at Grad Ball on Saturday 01 June. The four-piece pop/funk band, have previously featured as BBC Radio 1’s Track of the Week after being spotted by the BBC Introducing team. Dubbed as the ‘ones to watch’, the group are set to deliver an energetic support at this year’s Garden Court stage. The news comes following the announcement of acoustic singer/songwriter, Hannah Trigwell as headliner of the acoustic stage on the Redbrick and DJs Tom Zanetti and K.O. Kane in The Cube. Prepare for more exciting acts to be revealed over the next few days on our official Facebook event as we countdown to the final few weeks before the big night. *Tickets will be available to purchase for £40 from 01 June – that £5 saving by getting them before means another drink, think about it!